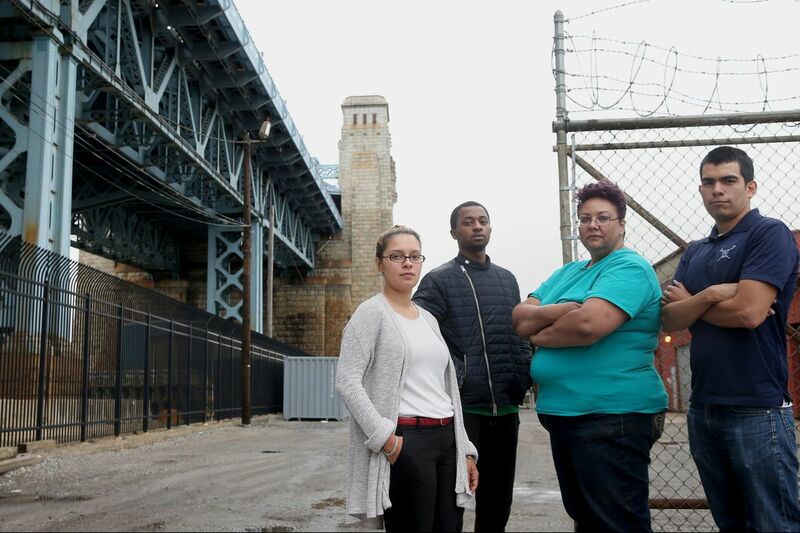 From left, North Camden residents Felisha Reyes Morton, Rudy M. Underdue, Jackie Santiago and Luis Gaitan stand for a portrait outside the F.W. Winter building in Camden. They oppose the proposed erection of a 16-story digital billboard on the site by Interstate Outdoor Advertising. A South Jersey company that wants to build a billboard at the base of the Ben Franklin Bridge in Camden has asked the city to postpone a hearing with the zoning board to seek approval for the proposal, officials said Monday. Drew Katz, CEO of Interstate Outdoor Advertising, said the Cherry Hill-based firm sought a delay partly for more time "to allow for dialogue with the community" before moving ahead with the proposal to erect a 167-foot-high billboard in North Camden near the Delaware River waterfront. A hearing on the matter was scheduled for May 7. Vince Basara, a city spokesman, said the zoning board would now consider a variance request from Interstate at its June 4 monthly meeting at 5:30 p.m. If the request is approved at that meeting, it would take effect the following month, he said. Interstate needs a variance because the redevelopment plan for the parcel of land at Elm Street and Delaware Avenue where the billboard would be put prohibits billboards. The billboard proposal calls for two digital screens targeting northbound commuters who travel across the bridge. The proposal has gotten pushback from Camden residents and community groups who say the proposal would mar the skyline and negatively impact development on the waterfront. They are collecting signatures on a petition to block it.